Smart restaurant owners know that Google is an increasingly important part of marketing their business. Along with Google Business, Google's Adwords platform is at the centre of the search marketing world. Adwords is a sophisticated ad platform where advertisers bid on search terms to appear at the top Google's search results page when people search for those terms. Compared to Facebook, effectively using the Adwords platform is magnitudes harder, and as a result, restaurants often don't know where to begin. Whilst many restaurant owners understand the theory of Adwords advertising, many face a struggle removing some of the common concerns with Adwords advertising. In our experience, the questions restaurant managers ask boil down to the following fundamentals. I've heard Adwords is expensive. But how do I know if it's too expensive? How do I know if the campaigns I run in Adwords are profitable? I know that Adwords works on Cost per Click (CPC) so I pay for every click, but do I know what a good CPC is for my business? Planning. How much money do I need to run a campaign and how much new business can I possibly generate? Getting a grasp on these questions can remove some of the barriers and confusion with getting started with Adwords for restaurants. The key to answering these questions is data. By using a simple spreadsheet, you can understand whether you are likely to succeed at Adwords and also choose the keywords to achieve that success. The spreadsheet can also tell you whether this method of advertising is ultimately too expensive for your restaurant. Armed with the correct information you can make a solid plan for your Adwords campaigns, rather than guessing and hoping for a positive result. Whilst it's possible to use the spreadsheet with only estimated data, for accuracy you should try to input as much real world data as possible. On top of this data, it's also good to know some basic business metrics about your restaurant. There are 3 key pieces data you'll need to perform the calculation. Note: it's not necessary to have all, or any of it, to use the spreadsheet but the more you have the better your predictions will be. Conversion rate of your website - This is the rate at which visitors to your website turn into confirmed bookings. 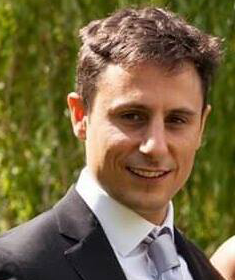 For example if you have 1000 web visitors a month and 100 go on to make a booking your conversion rate is 10%. Margin - The % profit you make on the revenue you generate. Enter data, if you have it, into the spreadsheet and then adjust fields to determine the Max CPC for which you'll be able to pay and remain profitable. If you don't have any existing data you can still use the spreadsheet to get an indication of likely cost of your Adwords campaigns. This is done a adding a desired return on ad spend (ROAS) into the sheet. ROAS is a metric for understanding how much money you generate as a result of your ads. A 100% ROAS is the breakeven point. A 200% ROAS means for every $1 spent, $2 of revenue is generated. The above example shows the effect on Max CPC if you change certain variables in your campaigns. Now that you have an indication of the Max CPC you can afford to bid on any given keyword, you can directly compare this to estimated keyword bids from Google to predict which keywords you can profitably bid on. 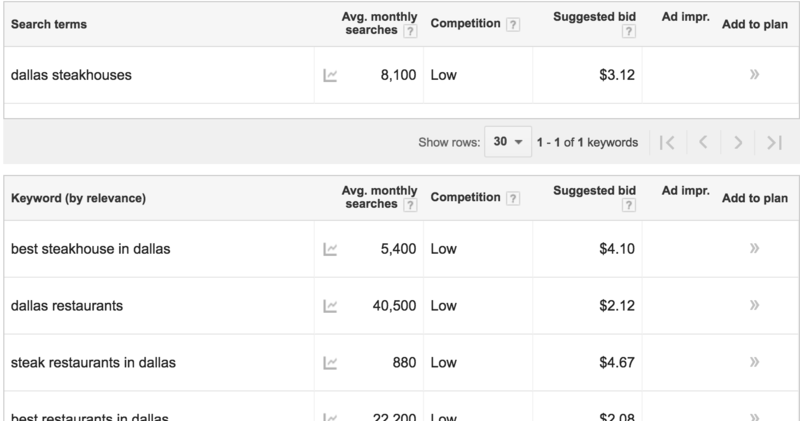 Use Google keyword planner to generate a list of potential keywords for your restaurant. Select 'Search for new keywords using a phrase, website or category.' Enter a base keyword such as 'steakhouse in dallas' and hit get ideas. For a more advanced guide to the Google Keyword Planner see here. Once you have a list of ideas, download the data as an excel sheet from Adwords and delete all the columns except the 'keyword' and 'suggested bid' column. Then copy and paste these two columns into the first two columns of the 'Compare CPC' tab in the spreadsheet. The excel will automatically show which keywords are above the Max CPC generated in the previous step. From here you can go though the list and asses if relevant keywords to your restaurant have a low enough CPC to be profitable and are good candidates for you to bid on in your Adwords campaigns. 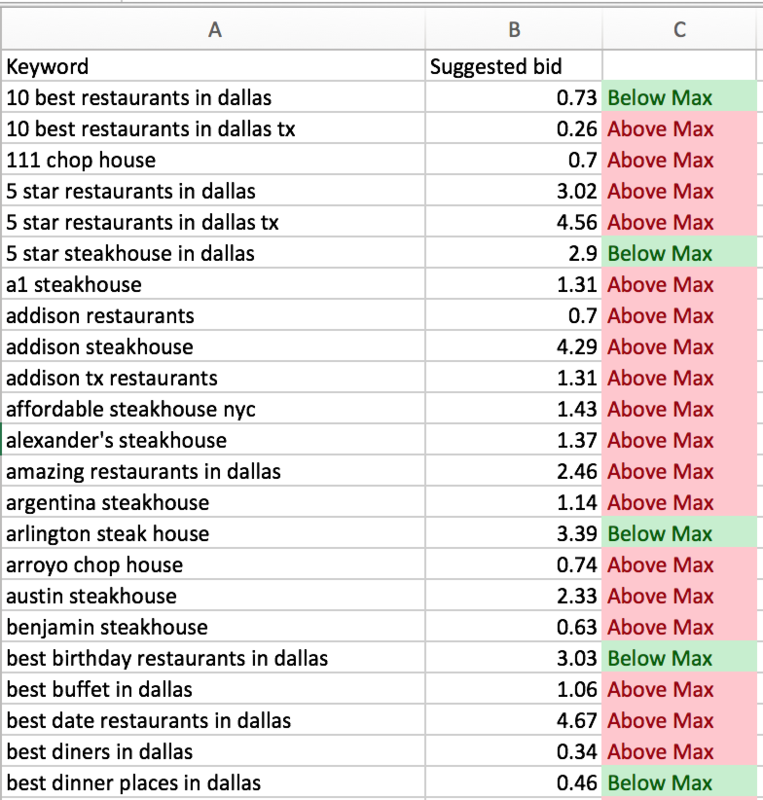 By using the attached spreadsheet you now have a system for estimating whether you can run profitable Adwords campaigns for your restaurant. If you find that your Max CPC is $1 but your keywords are mostly costing $4 then at its current position, your business may not be suitable for Adwords. In this case you can implement strategies to improve conversion rates and/or raise margins to allow more aggressive bidding in Adwords.